Lacking racing opportunities in New Zealand, Howden came to England at the age of 19 and found employment as a mechanic. That was in 1961, and it was not until 1967 that he had earned enough for a real crack at Formula Three. Success was slow in coming, and only in 1970 did he enter the limelight by finishing second to Peter Gethin in the Formula 5000 Championship. This helped him land a Formula One ride with BRM for 1971. 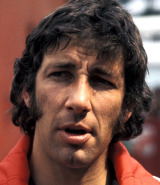 Points were scored before the end of the year, and Howden stayed with BRM for 1972, albeit with little improvement in form, although he did finish second in the Le Mans 24 Hours. Changing to Frank Williams' young team in 1973 failed to help since the Iso chassis was no world beater, and he quit the sport's top category after two races with March and two non-qualifiying runs with the Japanese Maki chassis in 1974. Howden joined forces with fellow Formula One racer Tim Schenken to form the Tiga (Tim/Ganley) race car manufacturing company.